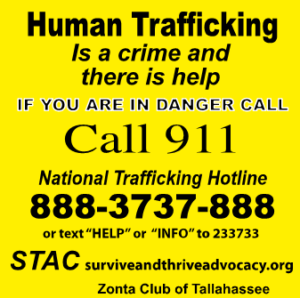 Support STAC's Mission to: Provide emergency and joint case management for survivors. 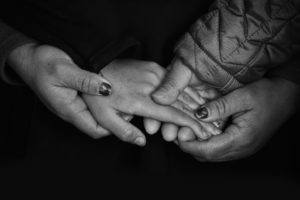 Work with existing agencies and organizations as a single point of contact for those who are assisting survivors. Collaborate with our partners to provide services such as shelter, case management, health care, legal services, education, job assistance, and counseling. 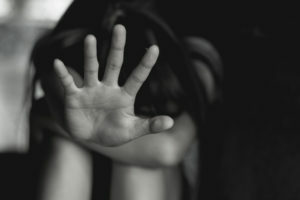 Promote public awareness of human trafficking. 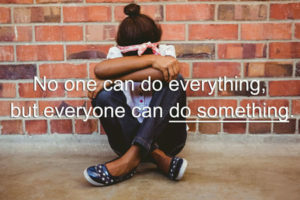 Provide workshops and training for professionals and the community to enhance their knowledge and skills to recognize and serve human trafficking survivors. From January to May of 2018 we’ve assisted 10 survivors and provided 96 hours direct victims support. We have recently partnered with the Kearney Center which provides 24-hour comprehensive emergency services to individuals experiencing or on-the-verge of experiencing homelessness within the Big Bend (8-county) region to identify and assist those who may be victims of trafficking. We are so grateful for your support! 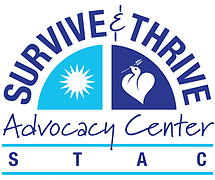 The Survive and Thrive Advocacy Center, Inc. (STAC) is a tax exempt organization as defined within the Internal Revenue Code Section, paragraph and subparagraph 501(c)3. 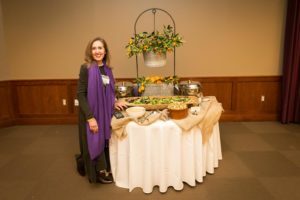 As such, contributions made to the organization are generally considered deductible in full to the extent allowed by tax law. We suggest that you consult your tax advisor if you have questions on the deductibility of this or any contribution. 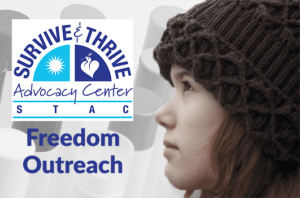 THE SURVIVE AND THRIVE ADVOCACY CENTER, INC. IS REGISTERED WITH THE FLORIDA DEPARTMENT OF AGRICULTURE AND CONSUMER SERVICES AS A CHARITY TO SOLICIT AND COLLECT CONTRIBUTIONS WITHIN THE STATE. OUR REGISTRATION NUMBER IS CH49747. A COPY OF THE OFFICIAL REGISTRATION AND FINANCIAL INFORMATION MAY BE OBTAINED FROM THE DIVISION OF CONSUMER SERVICES BY CALLING TOLL-FREE WITHIN THE STATE (800-435-7352). REGISTRATION DOES NOT IMPLY ENDORSEMENT, APPROVAL, OR RECOMMENDATION BY THE STATE.